Alright my friends this is just a quick post today for some random things and to tell you that the pet series will be back next Friday. There’s been so much going on over here. Our heat broke last weekend, which happened last winter too. This time it was the ignitor, last year the fan. Brrrrrrr it was cold in the house and expensive. I have been trying to get random things done like organizing, cleaning, random paperwork, doctors visits, kids sports, skiing with girl friends and kids, diet cooking, trying to work out more often and finding someone for my taxes. Taxes stress me out so badly I can’t even tell you!!!! I want to apply for citizenship this year and have to make sure everything is perfect for my application. And just the thought of studding for the oral citizenship test makes me want to hyperventilate. I feel so stupid with my mommy brain sometimes. 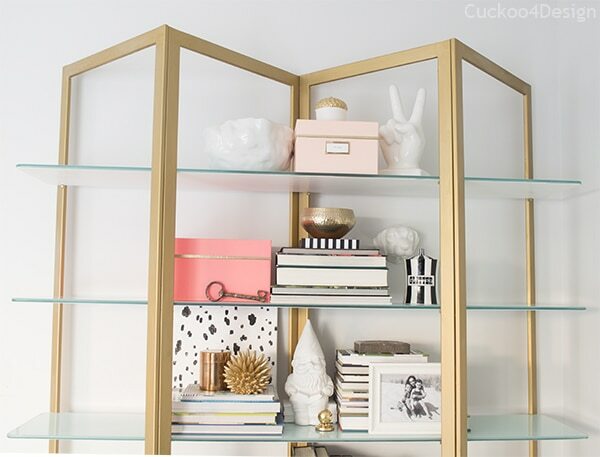 And I procrastinate with little things like cleaning and styling my brass shelving unit. If you follow me on Instagram then you have seen it already how I kept rearranging everything. That’s the stuff I really enjoy doing though…taxes what? Let me clean my shelf, ok?!?! “Moving stuff around!” 🙂 Say that with a German accent. On Monday it’s vet time for Lilly cat and Monkey (if you are new here you can read more about Monkey HERE). Lilly’s thyroid issues are getting worse and she’s been throwing up more than usual and Monkey needs her shots and I’m also getting her microchip. That really makes it official doesn’t it. She’s ours and I’m registering her publicly, don’t want her to ever get lost. She’s really conquered everyone, finally my husband too who admires her skillful hunting. The bizarre thing is that she appears to bring me yucky presents when I’m really stressed out and upset. I call it “vole sushi” … and I’m usually gagging when she is so kind to bring me chopped up leftovers. It’s a learning curve to have a cat that can roam around and do her own thing. I took these pictures last night. Don’t you love how Lucy snuggles with her toys? I wish every pet would have a warm spot to snuggle up to like this at night when it is this cold out, or well no I mean every day not just when it is this cold out. I remember last year I would still try to catch Monkey on the front porch at night to bring her into the warm bathroom when it was this horribly cold out. She was still so scared though and it was a huge effort. I actually couldn’t sleep at night if she was still out there. I’ve become to love her so much just like the other ones. That’s it for today my friends. I’ve had lots of friends pass the citizenship test. You’ll do great! And you really are a softie for our feline friends. Just shows what a kind person you are. Have a great weekend! I’m stressing out so badly, especially after seeing all the questions on the flashcards. My brain doesn’t really remember stuff like that, now if I’d have to remember design things like paint colors that’s a different thing. Have a great weekend Theresa. Your shelving looks great, I love the little gnome. 🙂 For good luck! You take such good care of your little munchkins, I wish too that all animals had a good family of their own that takes care of them. Have a great weekend! The gnome lights up too and I love that at night. He makes me smile! Have a great weekend too. 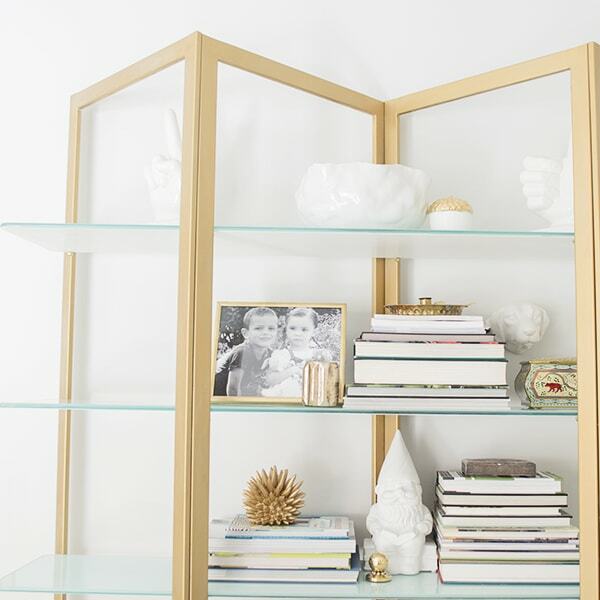 Love your shelf styling.. and would love to see you break down shelf styling (how you do it, what your thought process is, etc.). I need to pick your brain, because I’m terrible at it. Gosh I just do it and don’t think I’m great at it but thank you so much! 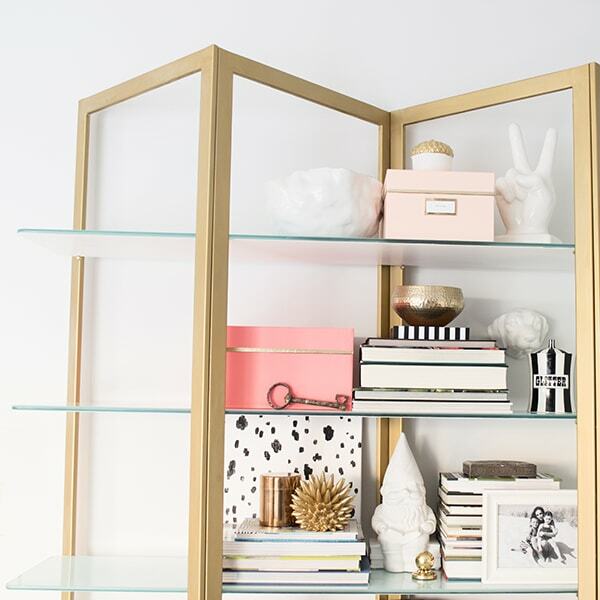 I love the brass shelving unit and the splash of pink you have applied. 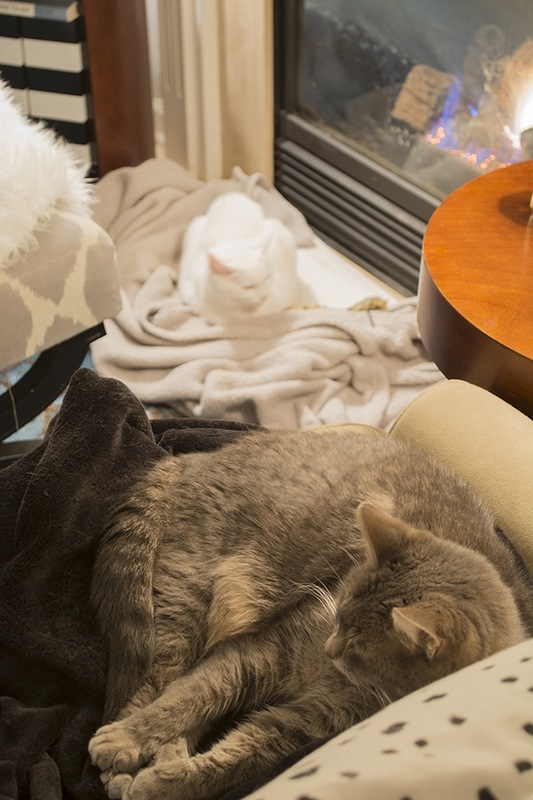 I understand about cold nights and animals that are outside….wish I could do more for fur children. You will be great on the test…don’t worry!! your shelves are gorgeous! and i am with you on pets and outside. 🙁 i love that ours have each other so that when i am not home, they can snuggle and keep each other warm (which they do). and i love that monkey tries to bring you lovely gifts when you are stressed. ha. Yes it’s perfect when they snuggle together. Mine do too! I am not a “cat person” but your posts about your kitties almost make me want to convert! It’s the litter box that does it for me and also how aloof some cats are… I like that I can pick up my dog and make her snuggle with me without having to worry about her drawing blood. Also I’m a CPA and I hate taxes if that makes you feel better. I don’t do any tax work in my professional life so taxes are actually pretty daunting even to me. It’s always really embarrassing to tell people that!! That is funny that you hate taxes too. I love the shelves…love love….I must of missed something along the way, but where did you get them??? I wish you the best with your testing. I am very proud of you and all you do! Those shelves are to die for! aww–warm, snuggly kitties–love! your shelves look great all the ways :). And I wish you hadn’t reminded me about taxes…this will be my first year dealing with any blogging income, and I’m a wee bit terrified. Yes, I’m terrified and sad that I will probably have to pay a tax specialist with the tiny amount I made to make sense of the accounting mess. Ugh! With all the love that you show to your family, blog friends, and furbabies, I can’t believe there is a more deserving person than you-you already make this country a better place! I wish you luck and am sure you will do well. I think the U.S. will be lucky to have a citizen like you! Your styling is totally on point! I’m a little obsessed with those boxes. It looks great! Awww your kitties are so lucky to have such a doting mummy! They are so sweet when they are sleepy and snuggly (I admit, I often stick my face right in Meisha’s spotty belly because it’s the SOFTEST PLACE ON EARTH.). I love your shelf styling! 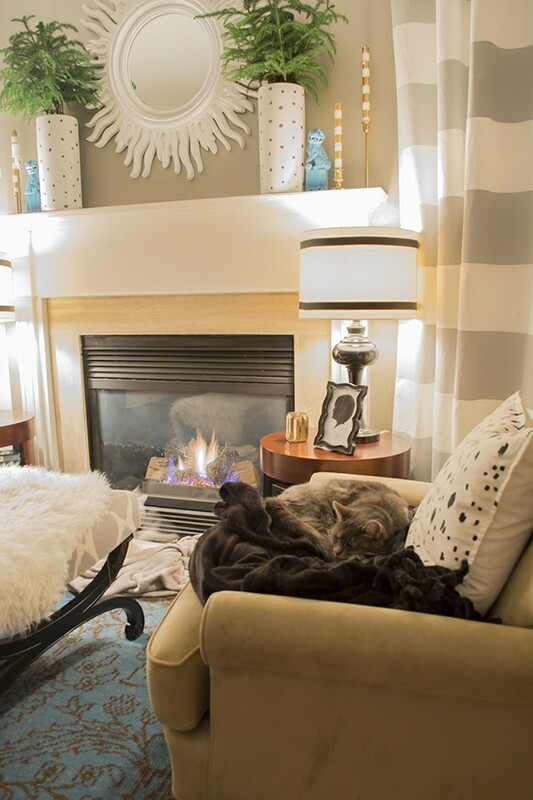 Those pink Kate Spade boxes are totally on my list for the office remodel. And the pops of black & white stripes are just SO GOOD. Yum. Thanks and oh I’m fretting AND I WILL KEEP BUGGING YOU TO SHARE THAT CUTE SPOTTED SOFT BELLY WITH MY READERS haha! My heart breaks for all the strays this time of year. We’ve rescued a few, found homes for a few more, and taken a lot of birds to the animal sanctuary. I gave my pound found cat to my sister because he was awfully stressed with our last move, the baby, the dog. He’s so much happier now and I still get to love on him but I miss having a cat around. I luhhhhhve the different styled options you’ve photographed here. SO pretty! Oh paaaalease! I don’t know what you are talking about girl, I’ve seen your skills. There really is something therapeutic about styling and rearranging. Way better than taxes! Julia you are going to ace your citizenship exam! I just started studying for a big exam, as well, and I’m with you on how nerve racking it can be. Those shelves are styled perfectly! Looks lovely. As for the citizenship test, I took it about 5 years ago and it was the EASIEST “test” I ever had to do. So don’t stress too much about it. 🙂 Aloha from Hawaii! When I had the interview it was just the officer and me in the room so if you are worried about others, that was not the case for me. The whole interview was about three minutes. I think I was asked something about congress and then had to read a sentence in English out aloud which was super easy and there may have been one more question. I am sure you will do great, it is much much less stressful than a school exam or a job interview. Good luck! Oh that doesn’t sound so bad!! Thanks for the info! I was told it’s about 10 questions out of 100. I actually found a citizenship test app that I play with whenever I have to wait somewhere.